CNET gives SSD Data Recovery Software of SysTools an excellent rating for its simplicity to recover lost files from m.2 and NVMe type SSD. Software Suggest reviews SSD Recovery Tool for its high performance & accuracy in recovery of data after formatting Solid State Drive. SysTools SSD Recovery is an ultimate way for users to recover data from formatted, corrupted SSD. 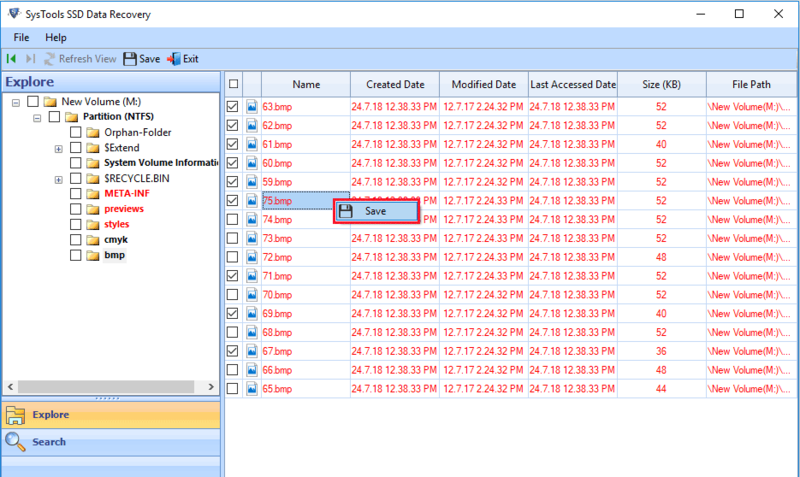 Recovered data is highlighted & listed in red colour for easy identification. Also the SysTools Solid State Drive Data Recovery Software is capable to restore Raw Data files like ZIP, JPEG, GIF, PDF, MPEG LAYER – III, PNG, DOCX, PPTX, XLSX, WAV, AVI, etc. 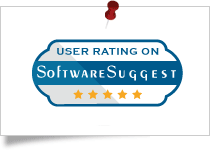 I would rate this software 9.8/10 for its user friendly & high performance. The information saved on our SSD drives seems immortal until the SSD drive malfunctions and everything disappears. But, SSD Recovery Software works amazingly to recover deleted or lost data from internal as well as external solid state disk drives. The tool successfully restores documents, images, audio, and all other multimedia files from NVMe and M.2 type SSD disk. 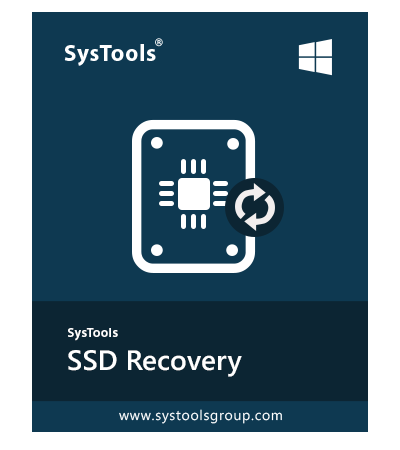 SysTools SSD Recovery Tool is a quick and efficient way to retrieve deleted data from GPT and MBR partitions of a Solid State Drive. Due to its simple GUI, both geek and non-geek users can use it to perform the recovery of lost media files. 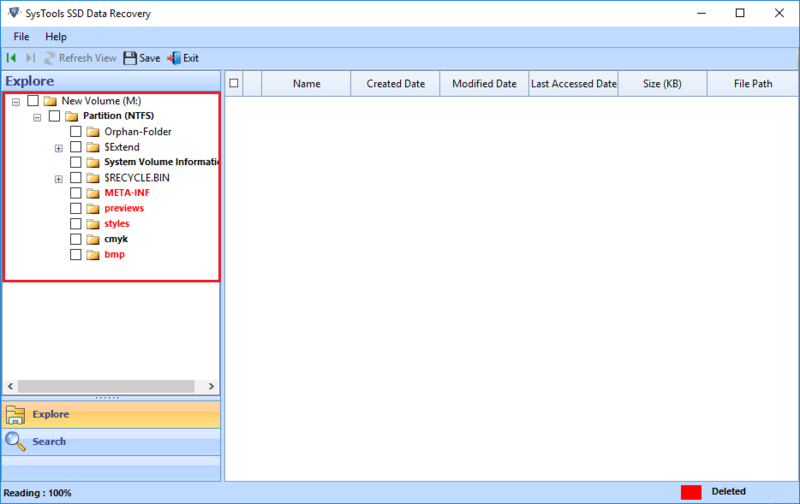 Moreover, one can use its specialized filters to export selected data items. 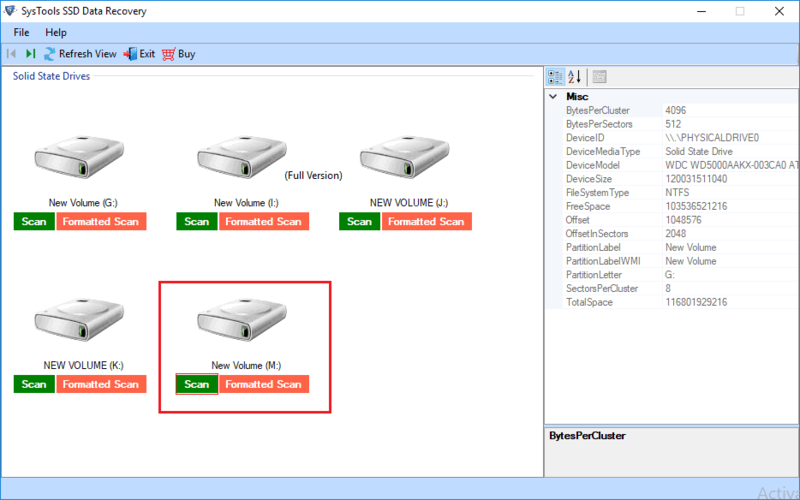 Easily recover deleted data from SSD (external or internal). SSD Data Recovery Tool did a great job of recovering lost images, documents, audio, video, PDF, and raw files from corrupted SSD. The software comprises a modern and clean GUI along with clearly stamped buttons. This is a powerful tool to recover large sized data files even without so much technical expertise. It also supports to recover files after formatting SSD. Know How to recover permanently deleted, formatted, corrupted & lost files from SSD drive? Why Solid State Drive Get Corrupted? There are multiple reasons behind solid state drive corruption. Some of them are listed below as well. 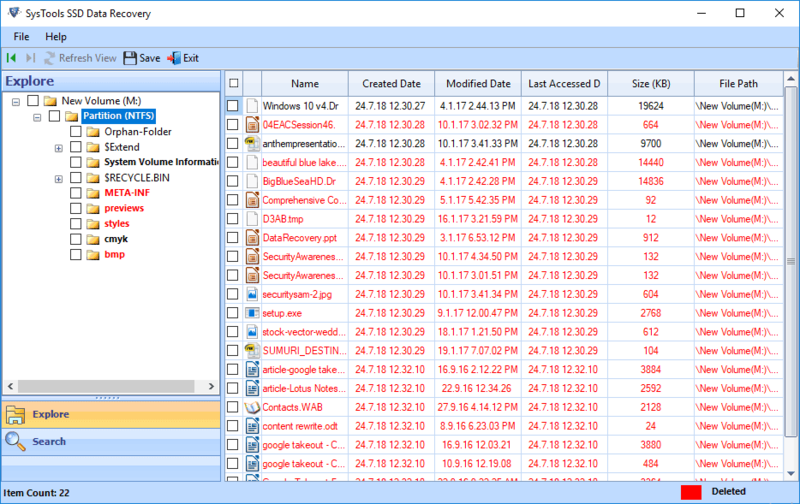 Use this utility to retrieve files from corrupted SSD. Download SSD data recovery wizard and install on Windows 10, 8, 7 etc. Trial version of solid state drive data Recovery software will recover deleted, formatted and corrupted data and provide preview only. Saving option is restricted in demo version. Find Your Question & Answer Here - How to Recover Lost Data from Hard Drive? How Can I Recover Permanently Deleted Files from SSD Using This Software? Using SSD recovery software is the best techniue to get back deleted files from formatted SSD. How to activate the software after purchasing license? If you have downloaded the demo version of tool and want to activate it then please contact our technical support team to obtain the product activation key. Else, if you have directly purchased the hard disk recovery wizard from the product order now page then no activation key is required. In this case, you will get an email with the pre-activated licensed version of the tool; within 48 hours of the order. Will this application run on Windows 10 computer system? Yes, this SSD data recovery software will have no issue running on a Win 10 system. With this it supports all versions of Windows OS like Win 8.1, 8, 7 and below. Does this SSD File Recovery Software is capable to recover deleted PDF files? Yes, this tool supports recovering all types of permanently deleted files from solid state drive. You can recover PDF files also with this application. Is this SSD Recovery Application capable to recover files from corrupted SSD disk? Yes, this utility is completely capable of restoring files from corrupted or damaged SSD disk drive. It can also perform NVMe SSD Recovery and m.2 SSD recovery. Can this tool restore data from external SSD drive only or does it support internal SSD also? This Solid State Drive Data Recovery Software provides support for all SSD. Be it internal or external, it can recover data from all types of SSD disk drive. Is there any file size limitation to recover deleted files from Solid State Drive? No, there is no limitation in terms of file size in this tool. You can retrieve files from SSD drive of any size. Is there an option to save the recovered files in local system in this program? Yes, there is an option to save recovered data too. 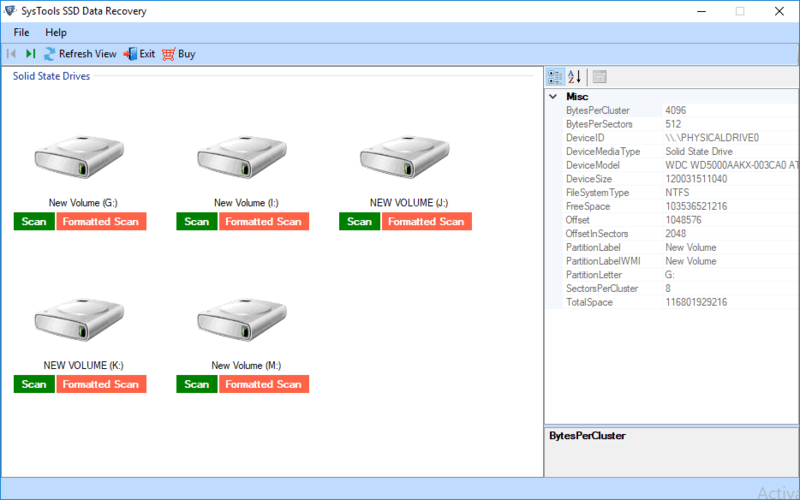 Solid-state drive recovery software allows users to extract and save the retrieved SSD data at any preferred location on the local system. Can I recover accidentally deleted files from NVMe SSD Drive? Yes, The software support NVMe SSD Recovery and m.2 SSD Recovery. 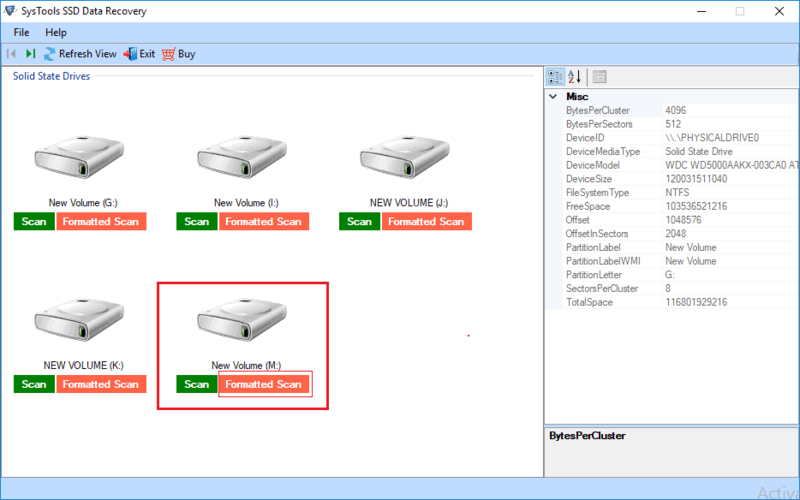 Simply launch the tool and recover permanently deleted data from NVMe SSD drive. Can I download SSD recovery software crack for free? Never Use Crack Software, If you are searching free serial key or cracked version of SSD file recovery software. The SysTools does not provides free crack or serial key for free. Also, suggest you to never user cracked software. How to recover files from formatted SSD using this software? SSD formatted, means all stored files and folders gone. But by using this best solid state drive data recovery software you can easily get back files from formatted SSD. The tool provides best technique for formatted SSD recovery. Can I recover deleted files from Samsung 840 pro SSD? Yes, If you are searching a hassle free solution to retrieve lost files from Samsung SSD. Then this is best utility for you. It supports all series of Samsung SSD like SSD 860 EVO 2.5", SSD 860 PRO 2.5", SSD 860 QVO 2.5”, SSD 970 PRO NVMe M.2, SSD 970 EVO NVMe M.2, SSD 860 EVO M.2 SATA, SSD 860 EVO mSATA, SSD 960 EVO NVMe M.2, SSD 970 EVO Plus NVMe M.2 etc. Get this utility and easily recover lost files from Samsung SSD. With this the tool is capable to retrieve files from all brand SSD like WD, Kingston, Intel 760p PCIe SSD, Crucial MX500 etc. Is this software capable to recover deleted files from 1TB SSD? Yes, The SysTools Solid State Drive Deleted Data Recovery software is capable to recover lost files from 1 TB SSD. Moreover the utility support recovery from all size SSD like 2BG, 4BG, 16GB, 32GB, 64GB, 128GB, 256GB, 256GB, 512GB, 1024GB, 1TB, 2TB etc. SSD Data Recovery Software is a wonderful tool. The SSD drive of my laptop got badly damaged and it became impossible to recover data from it. However, the data stored in it were valuable and I just could not throw it away. I started to look for a reliable solid state drive recovery utility and found this tool. It successfully recovered all files from that corrupt SSD drive. The support team helped me a lot! When I asked my colleagues about NVMe SSD data recovery tool, everyone said the process is critical. They also said that no application can perform the recovery properly. Later I heard of this software from my elder brother. It restored all my deleted data from NVMe solid state disk. Since then, I recommend this program to everyone who asks me regarding solid state drive repair utility.